Due to an unbelievably selfish main character, this book is not worth reading. Fourth-grader Ida B's life changes when her mother's illness forces her to go to public school for the first time, and her father to sell their land to new neighbors. Ida B resolves to become as "cold-hearted" as possible in order to make her parents change things back to how they were - homeschooling her and having the land all to themselves. Even with the knowledge that the main character is only nine or ten, Ida B's behavior throughout the majority of the book is inexcusable - she yells at her parents, teachers, and classmates, moves snakes and slugs into her new neighbors' basement, and (this is actually a big part of the plot) forces herself to treat everyone around her as arrogantly and meanly as possible. Ida B believes nature talks to her and guides her - through the book she repeatedly goes to trees or wades into a brook and listens to what they tell her. She then does exactly what she hears them say to her. Though her mom has cancer, she never prays for her but instead asks the trees if her mother will be ok. This kind of behavior is very dangerous for the young readers reading this book about a character their age seeking help not from God but plants. Ida B draws many different scenarios of the people she hates being struck by calamity - snakes, tarantulas, tornadoes, floods, etc. Ida B yells some hateful things (no cuss words though). Please don't read this book. 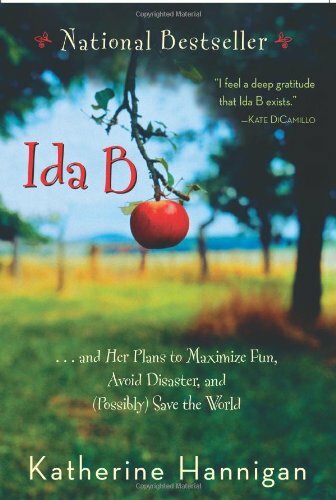 What is dangerous and puzzling is that the general consensus of critics, and the opinion of the author herself, is that Ida B is somehow "brave and true, fiercely loving." None of those things are true. Here we have a story about a little girl who listens to no one and does whatever she wants to, and who cares more about trees than about her mother who is going through cancer treatments and her father who spends all his time taking care of his wife. Being nine gives a child license to be immature, but NOT to have an arrogant, mean outlook on everyone around her.